Last month, we discussed how you can build your trust in your horse. This month, we will cover the other half of that equation: how can you build your horse’s trust in you? Some people believe horses are cowardly animals. While it’s true that they are a fright and flight animal, programmed to run when something frightens them, think about how quickly horses get over their fears once we show them they are not in danger. Some people spend years and lots of money going to therapy to get over their fears. Your horse can spot a new object and be completely convinced that it is going to kill him, and with only 20 minutes of consistent work he will be completely over his fear and will probably even remember not to be afraid next time he sees the same thing! Taking all of that into consideration, I would argue that horses are actually very courageous. To build my horse’s trust, I like to start with small challenges and work up to harder things in gradual steps. Start by making an obstacle course which includes many things of varying difficulty. You can use anything you find lying around the yard, it doesn’t have to be fancy. Some examples of things I like to use are a trash can, a piece of plywood, a garden hose, and a tarp. Set these obstacles around your arena, and ride your horse in. Pick the object that you think will be easiest to start. This will be different for each horse. Knowing your horse as you do, think about it for a minute and choose the object you think he will find least challenging. First, just ask your horse to look at the object. If he’s nervous, stay at a distance and let him look. As long as he is paying attention to the object, let him be. Once he gets comfortable enough that his mind starts to wander and he begins to pay attention to other things, ask him to walk towards the obstacle. If he stops, let him stand as long as his attention remains on the object. If he backs up, ask him to move forward to the point he was before, but other than that leave him alone. 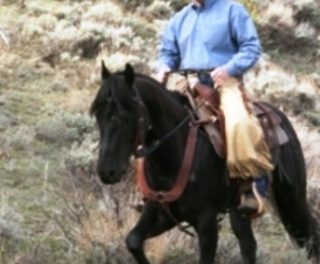 I want to mention here that if your horse backs away and you ask him to move forward again, it is important that you do so in a calm, quiet way. He’s already nervous about the new obstacle. If you get all worked up and start spurring on him, it will make the situation worse, not better. Once he is close enough to the object that he can touch it, let him smell it and investigate it as much as he wants to. I like to build and encourage my horse’s curiosity. If the object is something you just want your horse to walk by, after letting him check it out, ask him to walk forward and past it. If he still seems a little uneasy about the object, repeat the exercise until he is calm. If he walks by like there is nothing to it, move on to the next obstacle. 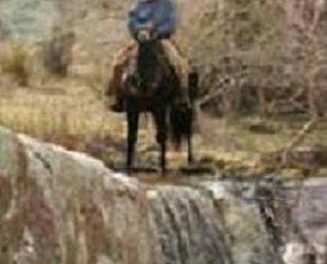 If you are working on one of the obstacles like the plywood or the tarp that requires your horse to walk over it, then just take it slowly, asking for one step at a time. If your horse puts just one foot on the object and wants to stand there and smell it or paw at it, that’s fine. Let him take his time. Again, when he walks over the object use your judgment, if he seemed to be nervous then repeat, if he was comfortable then move on to the next thing. Progress through your obstacles from easiest to hardest, take your time and approach each one in exactly the same way. This will build your horse’s confidence and trust. Now, move outside to look for new challenges: bridges, creek crossings, walking past flags and dumpsters, and anything else you can find. As you approach each obstacle, use the exact same training steps you used in the arena. As your horse’s trust builds, you will find new obstacles are easier and faster to work through. It’s not possible to expose your horse to every situation in the world, so what we’re trying to do is build a solid foundation of trust. That way he knows when you say something is okay, it’s okay, even if he hasn’t seen that particular object before. Always be patient with your horse. Never lose your temper. Losing your temper and spurring and whipping on your horse doesn’t build trust or respect, it erodes it. Your horse needs to know he can always win. When he tries, reward him. When he gives, you give back. Release and reward regularly. If your horse wins every time he tries, he will learn to try consistently. And that’s the biggest thing you can ask of your horse; that he will try for you in any situation you encounter. Enjoy building mutual trust with your horse, and until next time, may God bless the trails you ride. For more information on Ken McNabb’s programs call us at 307-645-3149 or go to www.kenmcnabb.com.